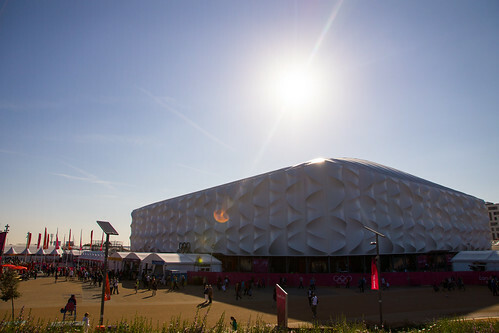 Another early start for me, and my first visit to the Olympic Park for a couple of matches in the preliminary men’s basketball rounds. Since the session started at 9am, I took seriously the “get there two hours early” suggestion, and found myself in St Pancras International at about 7am. By 7.20am I was in the park. While you can’t usually get the high speed trains from St Pancras to Stratford International included on your travelcard or Oyster Card, the travelcard that comes with your games ticket does include this option. The trains are frequent – all terminating in Ebbsfleet or Ashford, and at that time in the morning for me, pretty quiet. I certainly didn’t have to get in any queues – there were barriers set up outside the station in case. The only real concern I had was the rules surrounding which cameras you could take in. Although the rules state that you can bring kit in under 30cm, which counts out really long lenses, I was well within that limit. In the event the very friendly and efficient service men and women who actually x-rayed my belongings and frisked me down were fine about it as expected. The real concern is ensuring that you don’t licence your photos for professional use or for profit. So no Creative Commons on any you put on Flickr. It was a lovely early morning and I now had time to kill. Having skipped breakfast I decided to find some, which wasn’t necessarily a straightforward thing to do. For some reason the biggest McDonald’s in the world which is within the park, didn’t see to be open for business at breakfast – not even at 8am. Another branch was supposed to be open at that time but it’s on the wrong side of the park for the early sessions of Hockey and Basketball which most people were going to. In the end I bought some sandwiches in the “deli”. A little bit of a misnomer since it sold a limited number of sandwiches, drinks and “treats” (aka Cadbury’s sweets). The queue trailed throughout the store, and I was surprised not to be able to useless contactless technology with my Visa card – something that was being widely touted. Filling a plastic bottle with water from a fountain was easy, and the park is pretty well signposted. There are long walks to get around it though. It really is large. 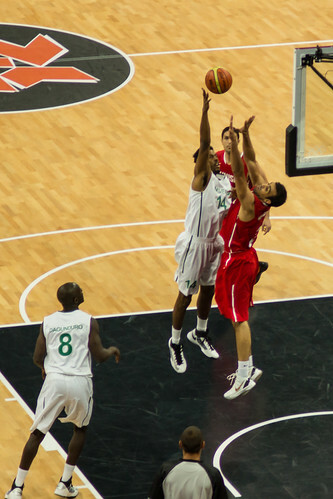 Getting into the temporary basketball arena – it has been sold to Rio after the London events are over – was straightforward. I had a category C ticket which placed me about halfway up the upper tier. The lower tier is pretty small and largely made up of higher cost tickets. Most spectators are in the upper tier. One side of the venue is for media positions. But these being preliminaries, they never got more than half full. 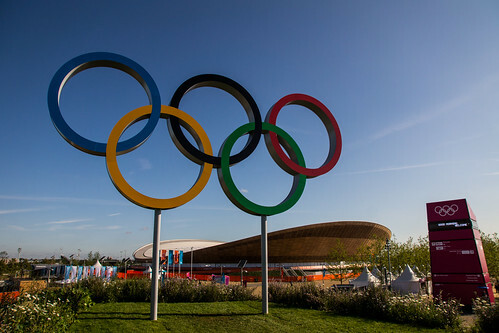 Later games shift to the “North Greenwich Arena” (aka the O2), once the gymnastics has finished there. 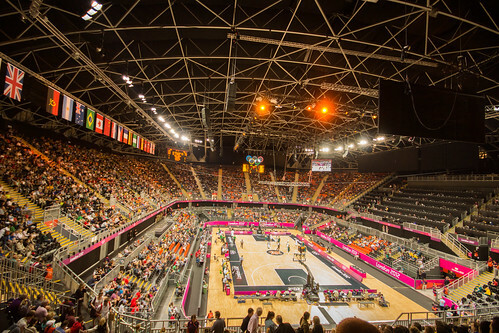 But the 12,000 or so seats mean that most people get a decent view of the court. First up was Nigeria v Tunisia. At first it looked like Nigeria was going to walk it. But by the end there were only four points in it, and Tunisia made a real fight of it. The second game on was much more anticipated. No not the USA – they played in the afternoon after I’d had to leave. 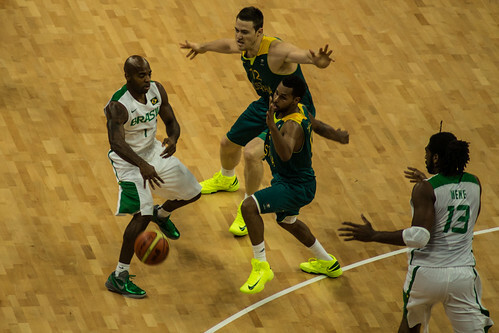 But Australia v Brazil was very well supported with lots of fans from both countries in the arena. Aussies had arrived early in the morning anyway since there was an Australia/New Zealand hockey match at 8.30am. New Zealand won that fixture. 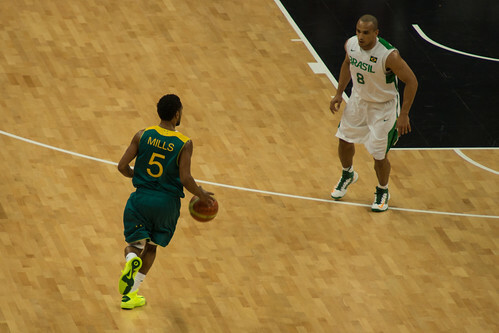 Both sides had NBA players – with “Patty” Mills being the standout player on court. But he couldn’t do enough to prevent a strong Brazilian team overcoming the Australian side. That certainly dampened the enthusiasm of people sitting near me. One of the stories of the first few days of these games has been that of empty seats. There are certainly very few seats still on sale. At time of writing there’s a session tomorrow available. But it must be said that there were plenty of empty seats even allowing for people only watching one of the two matches in the session. In my row of ten seats, only three were occupied – my seat came via another country’s NOC, legitimately acquired I should add. And in the most expensive seats, there were up to 50% vacant. I suspect that many of these have gone to media, governing bodies and sponsors. 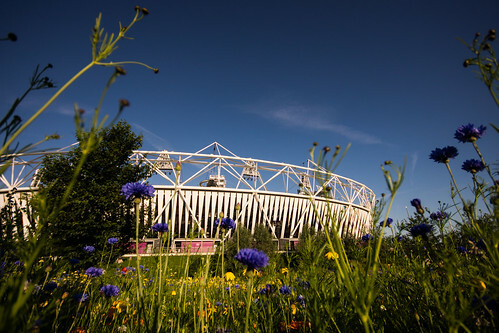 But it’s shame that they’re sitting in envelopes or desk drawers while I know people who’d love the opportunity to see anything in the Olympic Park. On the plus side, the guy who was the PA announcer inside the arena did an excellent job, keeping the crowd interested all the time. 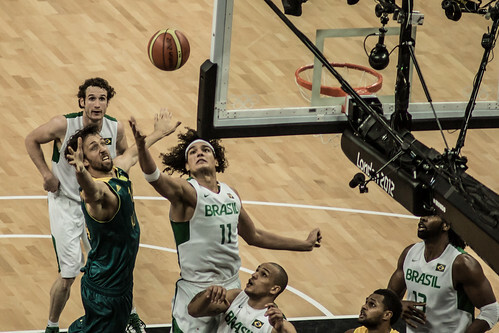 Although Olympic basketball has fewer breaks that NBA, there are enough that he kept everyone entertained. I’m no fan of “Mexican waves” but it was very amusing seeing him orchestrate a slow motion one. Exiting the arena was quite slow, but it soon become clear why. It was pouring with rain outside. That also meant that anywhere with an inside was filling up. The now open McDonald’s had a massive queue, while a PA announcer apologised for long waits to get into the 2012 Megastore. I decided that I’d avoid the overpriced food and queues, and leave the Park. I have other opportunities to visit. On my way out I couldn’t help but notice the large number of NBC people wandering around the park. I saw three NBC “guides” taking groups of visitors. Whether they were part of the 2,700 employees the US network has brought over (compared to the BBC’s fewer than 800) I’m not sure. In summary then, it was a pretty positive experience. Everything seemed to work smoothly and people were unfailingly pleasant throughout. Yes food and drink isn’t cheap – especially as you can’t bring the latter in yourself. But that’s par for the course at most sporting arenas. And oddly the biggest failing is perhaps that there aren’t actually enough food outlets and concessions. Obviously the park’s capacity will vary on a daily basis, but you get shorter queues at major music festivals. Sometimes the signs are a little misleading. On exiting, I wasn’t allowed to follow the massive signs to Stratford International because that exit hadn’t actually opened. Perhaps electronic signs that could be amended would have been better. And it was a similar story at the station, where a queuing system was unnecessary, and in any case people were told to follow signs to the DLR rather than the signs pointing to Javelin trains into London. All a little confusing – especially if you don’t speak English to ask someone. And a side-note about WiFi. BT Openzone has put pretty decent WiFi in place across the Park. It was certainly nice and strong in the venue I visited this morning. I have a contract with Orange, and that comes with access to BT Openzone hotspots. Except it doesn’t quite. It seems that BT classifies their hotspots in three ways, and this was a business hotspot. So Orange (and Vodafone) customers don’t get access. O2 (and Tesco) customers do. I found another way to get online using a BT Broadband login, but failing that you’ll have to buy time direct. To be fair, it seemed to work exceptionally well, and at one point I was happily streaming video via the BBC Olympics app. Although I should say that yesterday I managed much the same thing using 3G. And the work mobile phone companies seem to have done across the park meant I had far better 3G coverage than I’ve ever had at any other sporting occasion. So congratulations are in order for that. However the presence of WiFi is clearly a strong benefit. Just a shame that some mobile customers who thought they had full access, don’t. Before leaving Stratford I looked into Westfield, but couldn’t face eating there. I did wander into John Lewis, but they had a queuing system in place just to get into their widely advertised 2012 store. The queue was an hour long and started the floor below. I quickly left. So my advice would be – get there early, but bring your own food. And if you want to visit the stores or concessions, then go early. The aforementioned Megastore was open early and was pretty empty when I first walked past it. Anyway, leaving the site meant I got home speedily and was able to watch the last 25km of the women’s road race with Lizzie Armitstead got silver in despite the miserable rain it was fought out in. 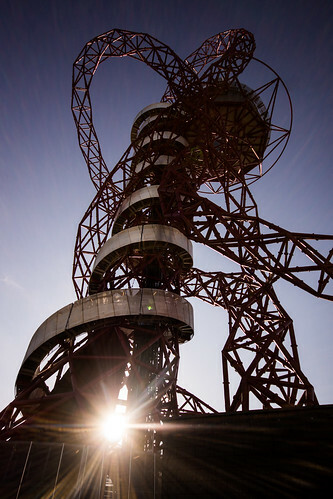 Tomorrow – swimming, fencing and The Orbit!